Here is a new submission to the Clockpunk anthology project “A Matter of Heart by Mark Simon“. Be sure to leave your comments on the story page itself. Some people have written to me that Terry Pratchett’s Discworld could also be considered Clockpunk. Since I have not read Discworld, I would like to ask the readers what their opinion on Discworld is and if it can indeed be categorized as Clockpunk then can someone please provide us with a brief synopsis. Joseph Francis, one of the readers of Da Vinci Automata left a comment about a screenplay that he had written some time on what seems to be a Clockpunk story. We thought that it deserved mention on the main page, so with his permission, here the description. Back in 1995 I wrote a screenplay called “Fury” which was based in the Rennaissance. The Ottoman ambassador is murdered during peace treaty negotiations with the Venetians. Not wishing a war to escalate, The venetians engage their best agent, A Renaissance-era superspy, equipped with the latest fifteenth century high tech espionage gear courtesy of a young Leonardo da Vinci, and task him with solving the murder. The story escalates and we come to learn that the villain is an angry Byzantine who has stumbled across germ theory and realizes he can retake Contantinople by flooding it with plague rats. The hero is still my Renaissance-era ‘James Bond’ figure, although in the later version I introduce Lucrezia Borgia as the villain’s “moll.” I also have Machiavelli as the leader of the Ten of War, who fulfills a role loosely similar to “M” in the Bond franchise. I’ve kept this material to myself (other than shopping it around Hollywood) for years, but now that I see it is entering the public conciousness more I see no further reason not to talk about it. Da Vinci Automata Got Boing Boinged again! I recently got this book from the library and it looks promising. The author, Mark Rosheim, seems to have put together stuff from various Da Vinvi manuscripts to construct automatas based on the design. Here is the description of the book from the publisher. Leonardo´s Lost Robots reinterprets Leonardo da Vinci’s mechanical design work, revealing a new level of sophistication not recognized by art historians or engineers. By identifying his major technological projects, the book revisits Leonardo’s legacy of notebooks, showing that apparently unconnected fragments from dispersed manuscripts actually comprise cohesive designs for functioning automata. 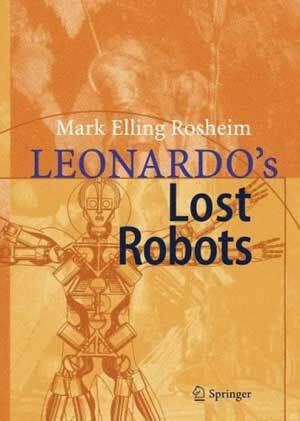 Using the rough sketches scattered throughout almost all of Leonardo’s papers, Rosheim has reconstructed Leonardo’s programmable cart, which was the platform for other automata: a Robot Lion, a Robot Knight, and a hydraulically powered automaton for striking a bell. Through a readable, lively narrative, Mark Rosheim recounts his adventures rediscovering and reconstructing da Vinci’s designs. In a foreword, the world-renowned Leonardo scholar Carlo Pedretti details the significance of these reconstructions for our understanding of Leonardo’s oeuvre. So here is a first submission to the Clockpunk anthology, “On Deep History” by Jim Rossignol. Be sure to leave your comments on the story page itself. Here is a treat for all you folks from San Diego, an exhibit on a robot knight based on Leonardo Da Vinci’s designs. (Click on the image for a larger view.) Here is an excerpt from the site. 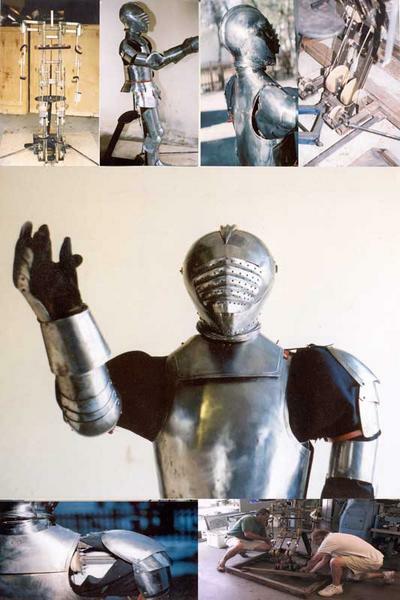 In 2003 the Sweeney family acquired, designed an exhibit, and then loaned for exhibit to the San Diego Museum of Man “Leonardo’s Lost Robot Knight.” This medieval robot was built by famous roboticist Mark Rosheim from Leonardo’s drawings for a Discovery Channel program on Da Vinci.